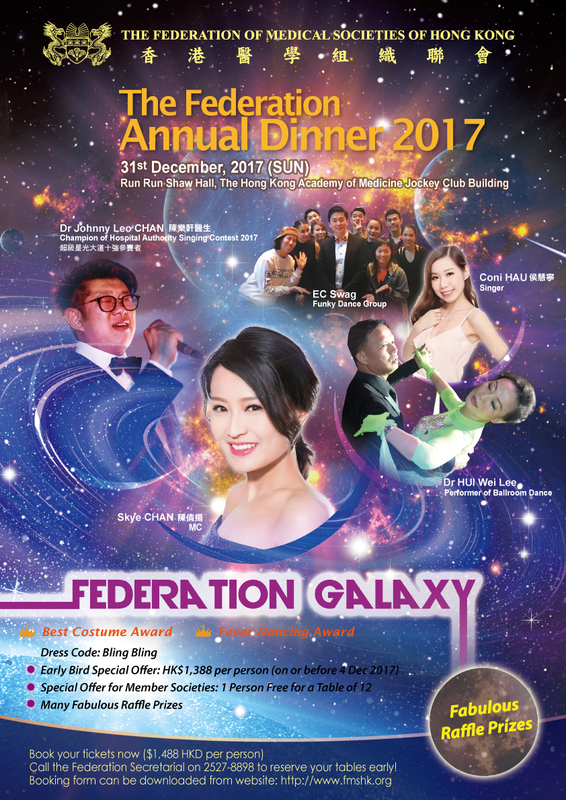 The Annual Dinner, held on New Year’s Eve each year, is one of the flagship events of the Federation in which friends and families gather to enjoy themselves and welcome the arrival of a new year. This year’s theme was Federation Galaxy. Like a galaxy, the Federation is full of stars and wonderful people. We had more than 260 guests from our member societies and the medical and healthcare communities. The programme and the venue were designed to match this shiny theme with brilliant melodies, sumptuous food and festive decorations. The glittering evening was hosted by Ms. Skye CHAN (陳倩揚). We were privileged to have many distinguished guests joining us, including Prof. Sophia CHAN, the Secretary for Food and Health; Dr CHUI Tak-yi, Under Secretary for Food and Health; Prof John LEONG, Chairman of the Hospital Authority, and Mrs Annie LEONG; Dr LAU Chor-chiu, Vice-President (General Affairs) of the Academy of Medicine; Dr HUANG Chen-ya, Past President of The Federation of Medical Societies of Hong Kong, and Mrs HUANG Chak-yee; Dr York Yat-ngok CHOW; Dr LUK Wai-sum, Vice President of Association of Licentiates of Medical Council of Hong Kong; Dr Bernard KONG, President of The Hong Kong Society of Medical Professionals; Dr Henry YEUNG, President of Hong Kong Doctors Union; The Hon Prof. Joseph LEE and Prof. Diana LEE; The Hon Dr LEONG Che-hung and Dr Lillian LEONG; Dr Laurence HOU, Dr LUKWai-sum, Dr Nancy YUEN, and Dr Bernard KONG. The presence of these honourable guests brightened up the evening and we owe them our heartfelt thanks. Throughout the evening, many superb and talented performers from the medical community gave a variety of performances during the dinner, including dance performances by EC Swag and Dr Ludwig TSOI, string music by Forever Fiddlers and members of the HKMA Orchestra, dance performances by Dr HUI Wei Lee and Mr Johnny LIU, Dr LAU Wing-ci and Dr Dora WONG, and Dr WUDui and Mr ZOUJian-yu, singing by Dr Johnny Leo CHAN, Dr York CHOW, Dr Nancy YUEN and Dr Samuel KWOK, and songs by the SPOT Band from HKOTA. The dinner was indeed a star-studded event. The highlight was undoubtedly the rendition of the Cantopop classic, ‘a Bright Future’, by Prof Sophia CHAN, Dr Mario CHAK, President of FMSHK, Prof John LEONG, Prof the Hon Joseph LEE, Dr York CHOW, Dr Nancy YUEN, Ms Tina YAP, Dr LAU Chor-chui, Dr KM SIU and our executive committee members. Everyone was thoroughly absorbed in the Bingo hosted by our very own bingo masters Dr Desmond NGUYEN and Dr Kingsley CHAN. Our guests turned into the stars of the evening in The Costume Prize and the Dance Fever Competition. The atmosphere of the evening was brought to a climax with the countdown party and pop classics performed by Dr Mario CHAK; Dr Ludwig TSOI, Dr Victor YEUNG, and Dr Desmond NGUYEN, EXCO members of FMSHK. After midnight, everyone was still enjoying themselves. There were many happy winners in the lucky draw because we had many fabulous prizes this year, including the Premier Prize of a 12-Day Aristocratic British Isles Cruise Vacation on the Princess Cruises’ Come Back Heritage Royal Princess, and delightful prizes such as the Venus Facial Package, AQ Bio Gift sets, KODAK Photo Printer Mini, and NDG Mini Me Coffee Machines. All in all, it was a beautiful night during which we shared our joy and excitement together. We express our sincere gratitude to all our sponsors, and thank all our guests for joining us on this memorable occasion.